Photoacoustic Tomography (PAT), also called the optoacoustic or thermoacoustic (TA), is a materials analysis technique based on the reconstruction of an internal photoacoustic source distribution from measurements acquired by scanning ultrasound detectors over a surface that encloses the source under study. Moreover, it is non-ionizing and non-invasive, and is the fastest growing new biomedical method, with clinical applications on the way. Dr. Lihong Wang, a Distinguished Professor of Biomedical Engineering in the School of Engineering and Applied Science at Washington University in St. Louis, summarizes the state of the art in photoacoustic imaging (1). The fundamental principle of the PA effect can be simply described: an object absorbs EM radiation energy, the absorbed energy converts into heat and the temperature of the object increases. As soon as the temperature increases, thermal expansion takes place, generating acoustic pressure in the medium. However, a steady thermal expansion (time invariant heating) does not generate acoustic waves; thus, the heating source is required to be time variant. Dr. Wang explains that “the trick of photoacoustic tomography is to convert light absorbed at depth to sound waves, which scatter a thousand times less than light, for transmission back to the surface. The tissue to be imaged is irradiated by a nanosecond-pulsed laser at an optical wavelength”. Absorption by light by molecules beneath the surface creates a thermally induced pressure jump that launches sound waves that are measured by ultrasound receivers at the surface and reassembled to create what is, in effect, a photograph. 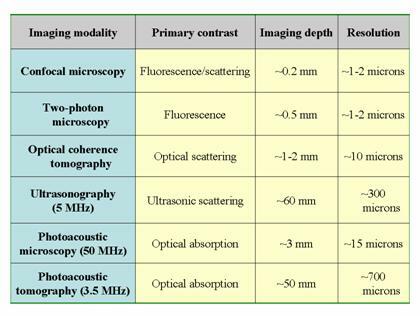 Table 1 Comparison of imaging modalities. Dr. Wang is already working with physicians at the Washington University School of Medicine to move four applications of photoacoustic tomography into clinical trials (2). The fourth to image the gastrointestinal tract. Sentinel node biopsy provides a good example of the improvement photoacoustic imaging promises over current imaging practice. Sentinel nodes are the nodes nearest a tumor, such as a breast tumor, to which cancerous cells would first migrate. Currently, sentinel node biopsy, includes injection of a radioactive substance, a dye or both near a tumor. The body treats both substances as foreign, so they flow to the first draining node to be filtered and flushed from the body. A gamma probe or a Geiger counter is used to locate the radioactive particles and the surgeon must cut open the area and follow the dye visually to the sentinel lymph node. Dr. Wang however, offers a simpler method: injecting an optical dye that shows up so clearly in photoacoustic images that a hollow needle can be guided directly to the sentinel lymph node and a sample of tissue taken through the needle. Most photoacoustic (PA) contrast agents are designed for absorbing laser, especially in the NIR spectral range. However, RF contrast agents are also desirable due to the superior penetration depth of RF in the body (1). A typical example is indocyanine green (ICG), a dye approved by FDA. ICG has high absorption in the NIR spectral region, and it has already been proved to increase the PA signal when it is injected in blood vessels. Most recently, methyline blue was used as the contrast agent to detect the sentinel lymph node (SLN) (4). Compared with dyes, nanoparticles possess a high and tunable absorption spectrum, and longer circulation time (1). The absorption peak is tunable by changing the shape and size of the particle. In addition, nanoparticles can be used to target certain diseases by bio-conjugating them with proteins, such as antibodies. Among different nanoparticles, gold nanoparticles are favored in optical imaging due to their exceptional optical properties in the visible and NIR spectral ranges, including scattering, absorption and photoluminescence. So far, none of the gold nanoparticles have been approved by FDA (1). One exciting aspect of photoacoustic tomography is that images contain functional as well as structural information because color reflects the chemical composition and chemistry determines function. Photoacoustic tomography, for example, can detect the oxygen saturation of hemoglobin, which is bright red when it is carrying oxygen and turns darker red when it releases it (3), that is important, since almost all diseases, especially cancer and diabetes, cause abnormal oxygen metabolism. For example see image 1. Image 1: melanoma tumor (MT) cells were injected into a mouse ear on day 1. By day 7, there were noticeable changes in the blood flow rate (top graph, right) and the metabolic rate of oxygen usage (bottom graph, right). Counterintuitively, the tumor did not increase the oxygen extraction fraction (middle graph). The colors correspond to depth, with blue being superficial and red deep (3). Wang’s team demonstrated that oxygen metabolism betrayed the presence of a melanoma within few days of injections in animal models, where as Oxygen use doubled in a week. and The gradient of oxygen saturation can be used to calculate the oxygen use by a region of tissue. Analysis of oxygen use is not necessarily new and is frequently measured by positron emission tomography (PET), which requires the injection or inhalation of a radioactively labeled tracer and undesirable radiation exposure. Breast cancer (microvascular). Additionally, for further information on photoacoustic tomography please read the article by Dr. Venkat Karra (I). photoacoustic tomography perfectly complements other biomedical imaging modalities by providing unique optical absorption contrast with highly scalable spatial resolution, penetration depth, and imaging speed. In light of its capabilities and flexibilities, PAT is expected to play a more essential role in biomedical studies and clinical practice.